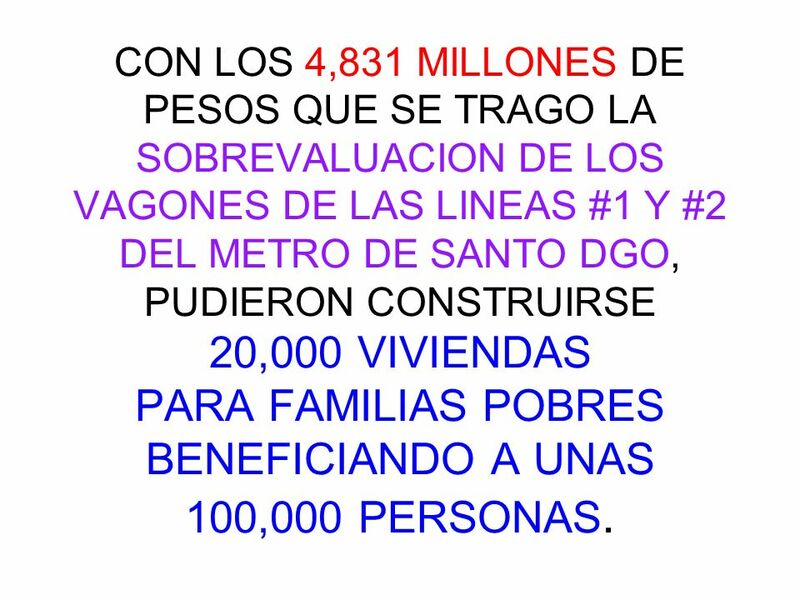 5 CON LOS 4,831 MILLONES DE PESOS QUE SE TRAGO LA SOBREVALUACION DE LOS VAGONES DE LAS LINEAS #1 Y #2 DEL METRO DE SANTO DGO, PUDIERON CONSTRUIRSE 20,000 VIVIENDAS PARA FAMILIAS POBRES BENEFICIANDO A UNAS 100,000 PERSONAS. 6 La gente opina que con el dinero de la sobrevaluación en la compra de los vagones del Metro de Santo Domingo, pudimos construir 20,000 viviendas para los pobres, y beneficiar a unas 100,000 personas... …Diandino prefirió levantar esta majestuosa y lujosa torre y centro comercial en la Ave. Tiradentes con Gustavo Mejía Ricart y se hizo aprobar una resolución del ADN que lo exonera de impuestos hasta el final de tiempos. 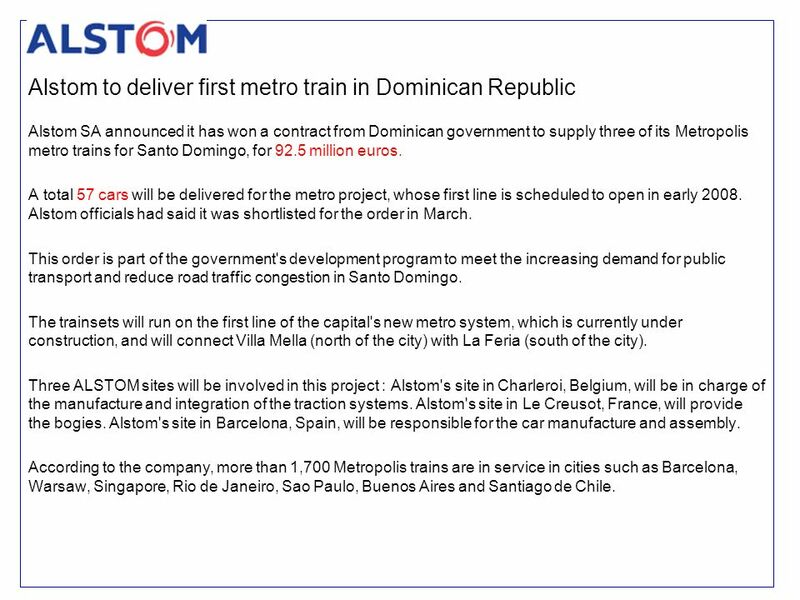 Alstom SA announced it has won a contract from Dominican government to supply three of its Metropolis metro trains for Santo Domingo, for 92.5 million euros. 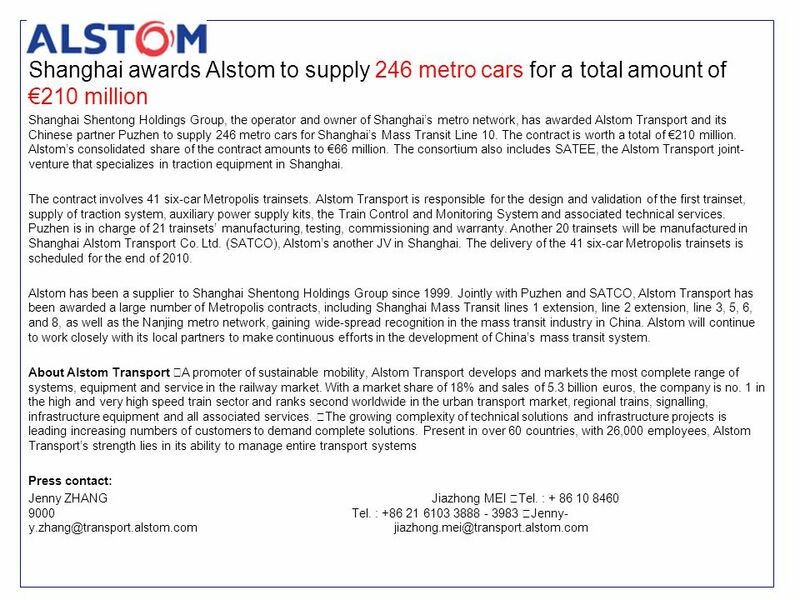 A total 57 cars will be delivered for the metro project, whose first line is scheduled to open in early Alstom officials had said it was shortlisted for the order in March. This order is part of the government's development program to meet the increasing demand for public transport and reduce road traffic congestion in Santo Domingo. The trainsets will run on the first line of the capital's new metro system, which is currently under construction, and will connect Villa Mella (north of the city) with La Feria (south of the city). Three ALSTOM sites will be involved in this project : Alstom's site in Charleroi, Belgium, will be in charge of the manufacture and integration of the traction systems. Alstom's site in Le Creusot, France, will provide the bogies. Alstom's site in Barcelona, Spain, will be responsible for the car manufacture and assembly. According to the company, more than 1,700 Metropolis trains are in service in cities such as Barcelona, Warsaw, Singapore, Rio de Janeiro, Sao Paulo, Buenos Aires and Santiago de Chile. 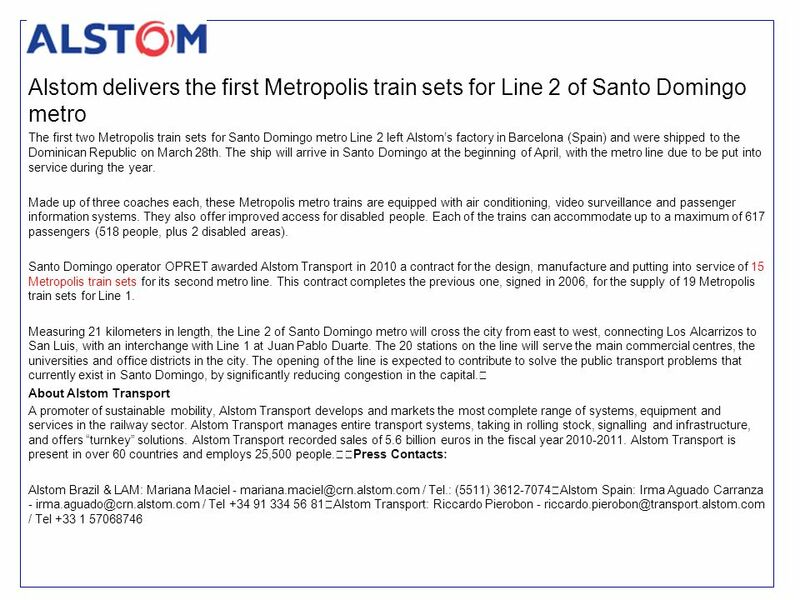 The first two Metropolis train sets for Santo Domingo metro Line 2 left Alstom’s factory in Barcelona (Spain) and were shipped to the Dominican Republic on March 28th. The ship will arrive in Santo Domingo at the beginning of April, with the metro line due to be put into service during the year. Made up of three coaches each, these Metropolis metro trains are equipped with air conditioning, video surveillance and passenger information systems. They also offer improved access for disabled people. Each of the trains can accommodate up to a maximum of 617 passengers (518 people, plus 2 disabled areas). 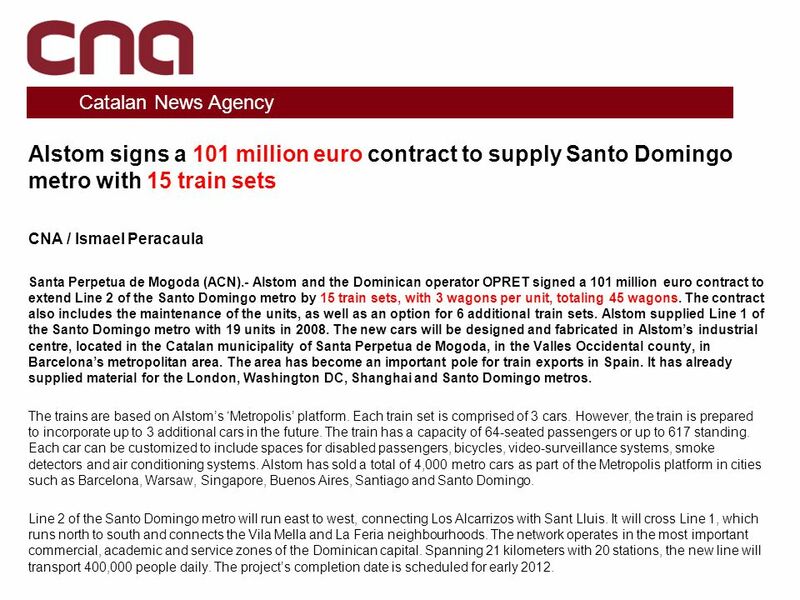 Santo Domingo operator OPRET awarded Alstom Transport in 2010 a contract for the design, manufacture and putting into service of 15 Metropolis train sets for its second metro line. This contract completes the previous one, signed in 2006, for the supply of 19 Metropolis train sets for Line 1. 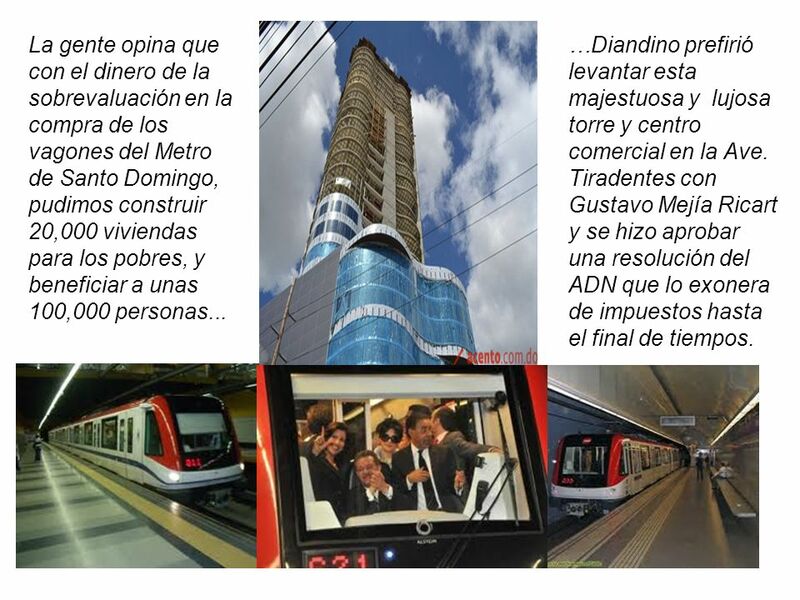 Measuring 21 kilometers in length, the Line 2 of Santo Domingo metro will cross the city from east to west, connecting Los Alcarrizos to San Luis, with an interchange with Line 1 at Juan Pablo Duarte. The 20 stations on the line will serve the main commercial centres, the universities and office districts in the city. 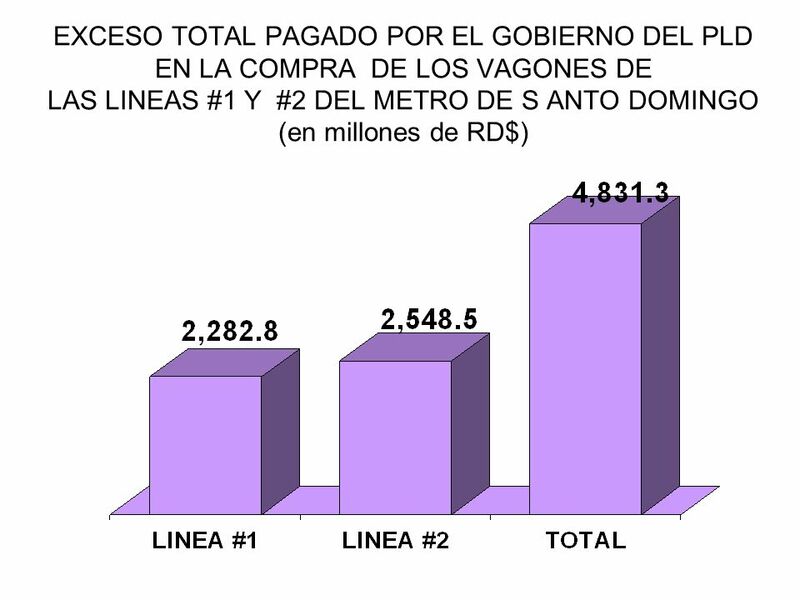 The opening of the line is expected to contribute to solve the public transport problems that currently exist in Santo Domingo, by significantly reducing congestion in the capital. About Alstom Transport A promoter of sustainable mobility, Alstom Transport develops and markets the most complete range of systems, equipment and services in the railway sector. Alstom Transport manages entire transport systems, taking in rolling stock, signalling and infrastructure, and offers “turnkey” solutions. Alstom Transport recorded sales of 5.6 billion euros in the fiscal year Alstom Transport is present in over 60 countries and employs 25,500 people. 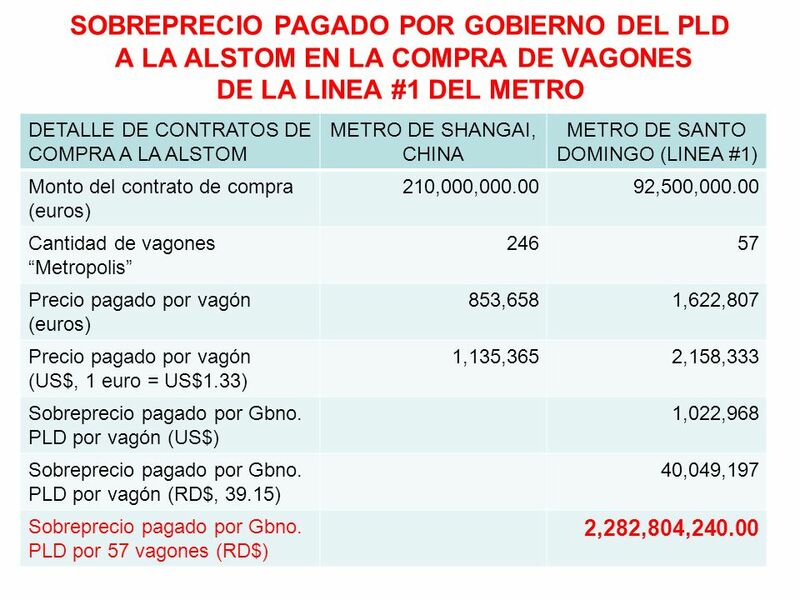 El 8 de diciembre del 2005, las autoridades mexicanas (Secretaría de la Función Pública) impuso una penalidad de US$27,000 y descalificó a la Alstom para obtener contratos del Gobierno Federal durante dos años, después que se reveló que la compañía había realizado depósitos a cuentas en el extranjero del Director General y Sub-Director para ganar contratos por valor de US$2.8 millones. El 6 de mayo del 2008 las autoridades de Francia investigaron a la Alstom después que el Wall Street Journal reportó que la empresa había pagado cientos de millones de dólares en sobornos para ganar contratos en Asia y América del Sur entre 1995 y Las autoridades francesas dijeron que la investigación fue el resultado de información provista por el Gobierno de Suiza en mayo del Alstom inicialmente negó de que estuviese bajo investigación por sobornos en referencias a contratos en Asia y América del Sur. 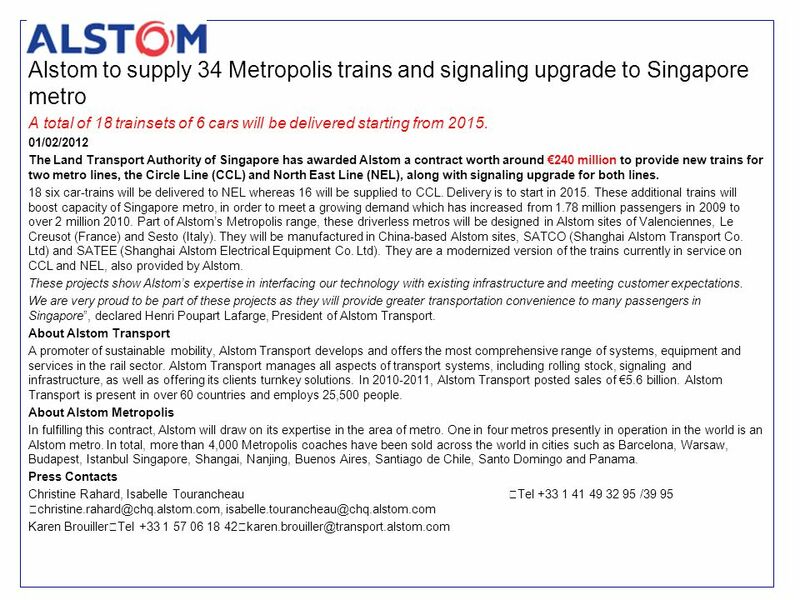 En un caso, el Wall Street Journal alegó que la Alstom pagó US$6.8 millones (£3.5 millones) en sobornos para ganar un contrato de US$45 millones para expandir el Metro de Sao Paulo. 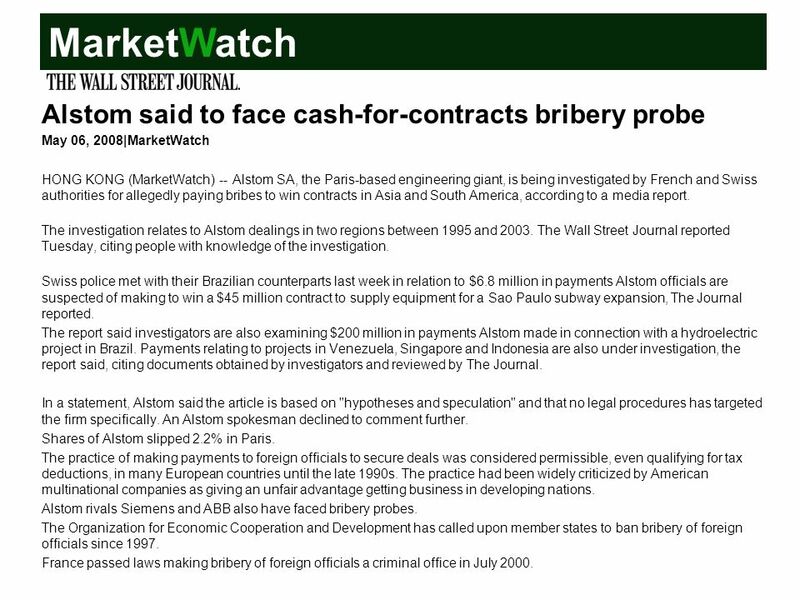 May 06, 2008|MarketWatch HONG KONG (MarketWatch) -- Alstom SA, the Paris-based engineering giant, is being investigated by French and Swiss authorities for allegedly paying bribes to win contracts in Asia and South America, according to a media report. The investigation relates to Alstom dealings in two regions between 1995 and The Wall Street Journal reported Tuesday, citing people with knowledge of the investigation. Swiss police met with their Brazilian counterparts last week in relation to $6.8 million in payments Alstom officials are suspected of making to win a $45 million contract to supply equipment for a Sao Paulo subway expansion, The Journal reported. The report said investigators are also examining $200 million in payments Alstom made in connection with a hydroelectric project in Brazil. Payments relating to projects in Venezuela, Singapore and Indonesia are also under investigation, the report said, citing documents obtained by investigators and reviewed by The Journal. In a statement, Alstom said the article is based on "hypotheses and speculation" and that no legal procedures has targeted the firm specifically. An Alstom spokesman declined to comment further. Shares of Alstom slipped 2.2% in Paris. The practice of making payments to foreign officials to secure deals was considered permissible, even qualifying for tax deductions, in many European countries until the late 1990s. 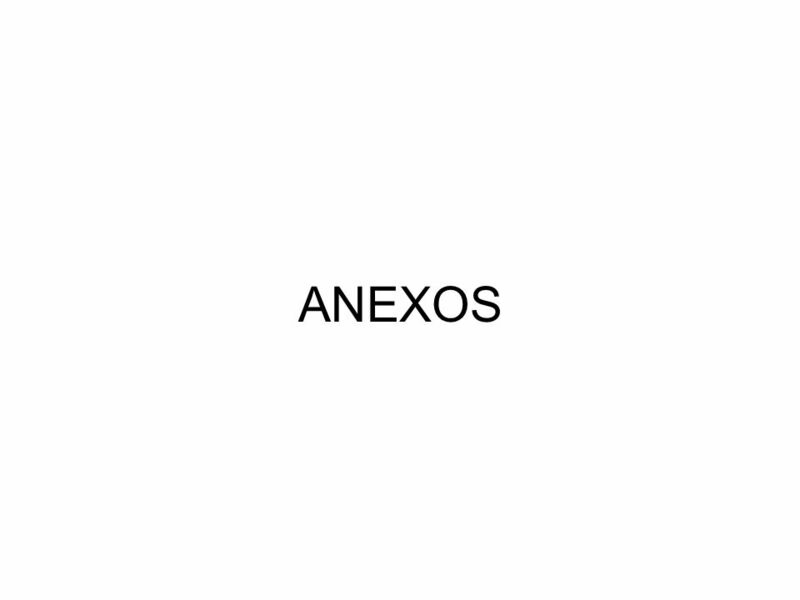 The practice had been widely criticized by American multinational companies as giving an unfair advantage getting business in developing nations. Alstom rivals Siemens and ABB also have faced bribery probes. The Organization for Economic Cooperation and Development has called upon member states to ban bribery of foreign officials since 1997. France passed laws making bribery of foreign officials a criminal office in July 2000. Descargar ppt "METRO DE SANTO DOMINGO (LINEA #1)"
News Ombudsmen in Latin American press: History, present and future Flavia V. Pauwels Buenos Aires University (UBA) Argentina. TOWARDS A NEW ECONOMIC BILL Héctor Silva Meeting - Breakfast September 16, 2009. Cancela, JM. Ayán C. University Of Vigo. Throughout history the definition of learning has been conceptualized in many different ways depending on the.